A young man learns from an honored master. An old tea gains the respect of the young. In 1980, at the age of 25, I tasted Puer tea for the first time. I was studying Art Restoration in Taiwan. My teacher owned an Asian gallery in the city of Tainan. My teacher was a devotee of fine and rare teas. Puer was just becoming popular among a small group of people, the artists of Taiwan. It was there on that beautiful island, and then, that I tasted this strange brew for the first time. I must admit I was impressed that my teacher would give me a cup of such a rare tea. I was learning how to restore fine Chinese paintings and my Master, an expert in art and tea chose to serve this to me. I was intrigued. Puer tasted like no other tea. I began asking many questions of my teacher and his tea-loving friends. My first discovery was that this unusual tea had its own name. I knew green and black and, of course, oolong. But this tea was in a class of its own. It was Puer. Next, I learned that it was old tea! Most tea is prized for its freshness, but not Puer. It was valued for its age. My third discovery was that this tea was not grown in Taiwan, where most of our fine teas were produced in those days. It came from far away, from China in Yunnan province. Historical records show that tea was grown by the ethnic Pu people as early as the Shang and Zhou dynasties. However, Puer first became widely known during the Qing Dynasty in the Imperial Court in Northern China, because of its many health benefits. It was also popularized then in Tibet and Mongolia. One thing all three peoples had in common, they ate a lot of meat. They ate almost nothing but meat. Puer was needed to soothe their aching stomachs. Puer can be aged as are fine wines. Like the antiques I was learning to restore, this tea becomes more valuable as it grows older. My teacher’s reverence for beautiful art was mirrored by an appreciation for fine tea. As I learned art restoration at my Master’s side, I also learned to appreciate the extraordinary qualities of Puer tea. In 1980, China and Taiwan had very distinctive identities. There was not much communication between the two lands. Puer, especially aged Puer, was most difficult to find. It could not ship directly to Taiwan, but, rather, had to go roundabout by way of Hong Kong. Rarity made it even more sought-after. Puer is grown in far south China where tea originated, in Yunnan province. The tea takes its final form in this same area in the city of Puer. 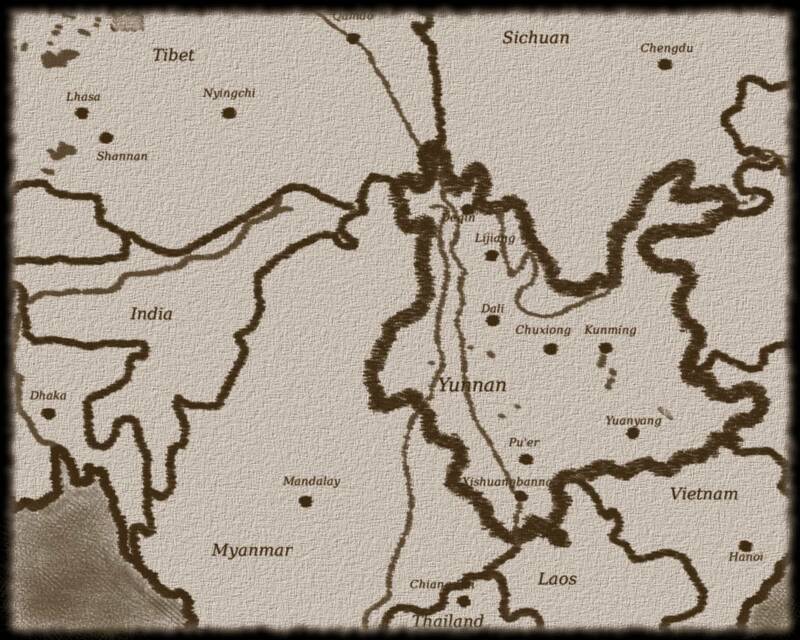 The city of Puer is close to Myanmar, Cambodia, and Vietnam. All of these countries share borders with Yunnan province. The history of the development of the tea plant began in south Yunnan. From there, in the long ago, tea migrated to southeast China, Fujian province and Taiwan, where it eventually became oolong; then to the eastern part of the Yangtse river where it emerged as the finest green tea, and on to India, where black tea was born. Wild tea plants grow in abundance in Yunnan province. Many existing plants, believed to be over 1,000 years old, are still healthy, and produce a very drinkable tea. This ancient, large-leafed tea plant differs from the small, manicured plants which provide most of the world’s tea. These wild plants, trees really, also provide the seeds from which green tea seed oil is derived. Green tea seed oil is a most remarkable, health-giving, and useful vegetable oil. But, that is another story. Tea plants are comparable to grapes: growers choose the right variety for the right tea. 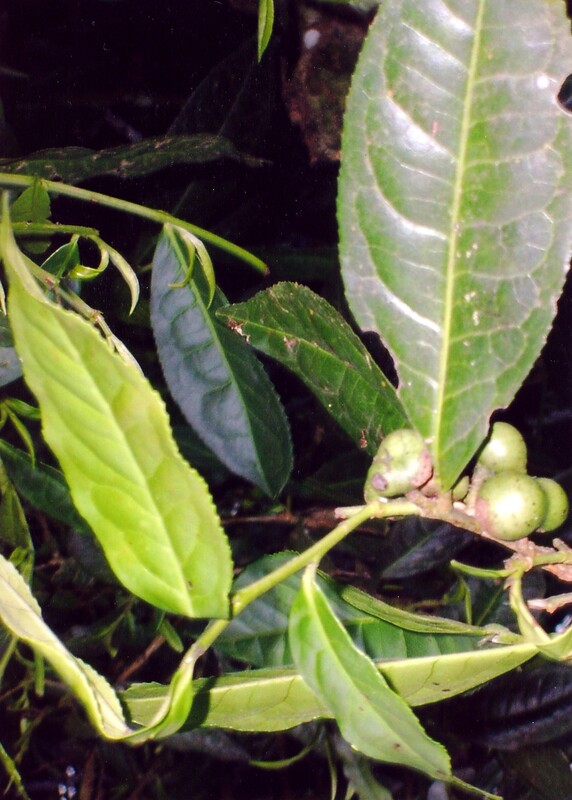 The large tea leaves have always been considered best for Puer. The area of southern Yunnan has high mountains, 2,000-3,000 meters. The average elevation is 1,000—2,000 meters. The soil is rich and the weather is warm, the perfect climate for very healthy tea plants. Like the tea that grows there, Yunnan province is a most remarkable place. 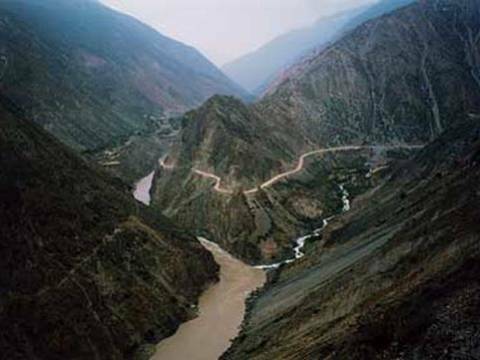 Four rivers begin in central Yunnan and flow outward. Flowing North is the Pudujian which flows into the Yangtse river; East, Nanpanjian which flows into the Pacific Ocean at Hong Kong; South, Lanquanjian flows into Vietnam and becomes the Mekong river; and West, Nujian which flows into Myanmar (Burma) and becomes the Saarwunjian. Many climates exist in the numerous elevations. The land flows from mountain to valley to mountain to valley. Almost anything can be grown somewhere in this wonderful province. It is thought that James Hilton’s Shangri-la was really in Yunnan. Yunnan is also called the land of four springs, meaning all of the seasons seem like springtime. The main city in Yunnan is Kunming which means Spring City. The old name for the province is Tian, the name of one of the famous lakes, and also means heaven. An old Tea Master once whispered that the Garden of Eden, from the Christian Bible, was really in Yunnan. Pu-erh had a special beginning. Originally, Puer was not sold in cake form. A few hundred years ago, during the Qing Dynasty, when the tea began to be sent to Tibet and to Beijing, it had to be transported a long distance over many high mountains. Then the cake style came into being. The tea was pressed into a hard cake to make transportation easy. The distance between Puer, Yunnan province, and North China and Tibet is great. 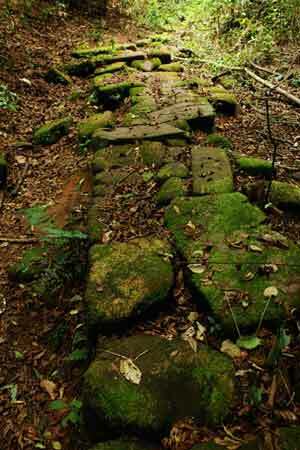 This ancient route has a special name. It is called “The Old Tea and Horse Way” the ancient road for tea and horses. This is perhaps the second most famous mercantile route in China after the great Silk Road. The Old Tea and Horse Way is actually six roads. 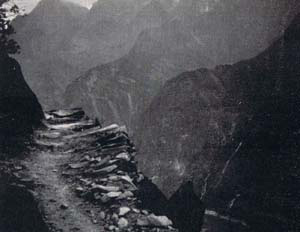 Journeying from Puer to Tibet along this road often took one to two years. The tea cakes were strapped to the backs of horses and donkeys and carried all the long distance to Tibet and to Beijing. Through spring and summer and autumn, through weather that was sometimes dry and sometimes wet, the pressed tea of Puer made its way north along the Old Tea and Horse Way. Upon arrival in North China, and in Tibet, the owners of the tea would taste it before selling the tea. They began to notice that the tea now tasted much better than it did when it began its journey. After some study, the tea owners decided that perhaps, a sort of magic had occurred during the transportation. The tea merchants began experimenting, looking for some way to produce this fine-flavored tea without having to strap it to a horse’s rear end for one or two years. Eventually there developed, in Yunnan Province, a special room for processing the Puer tea. Dry air, then wet air, was used trying to duplicate the conditions under which the tea had been created. The results were very similar. Both produced better tasting tea. Next it was discovered that the longer the tea aged the better it tasted, and so the older a cake of Puer was, the more valuable it became. In Yunnan, especially in Pu-erh, there grows a special type of spore that enhances the flavor of the tea. The processors of Pu-erh tea developed this to give Puer a very special taste. Attempts were made to recreate this process in other provinces without success. 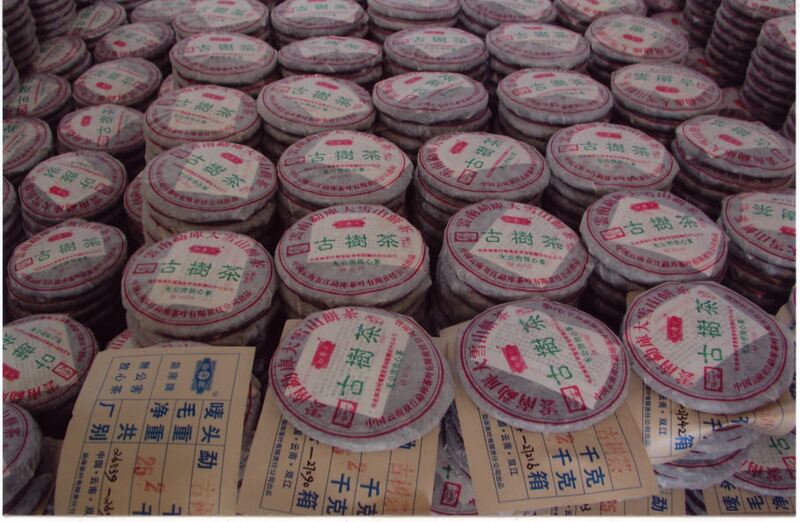 In the mid-1970’s aged Puer became very popular in Taiwan and Hong Kong. Tea connoisseurs began to act a bit crazy about acquiring aged Pu-erh, especially the 30 and 40 year old variety. Aged Puer is like aged wine. Different years have different flavors. The color after brewing is also important and distinctive. Different types of Puer produce gorgeous dark gold to deep brown colored brews. The flavor of Puer is incredible. It is unique. After one tastes a special Puer the flavor lingers on the tongue like a fine wine. It makes the brain very calm and the stomach smooth. The best Puer has two styles. One is green style, one is black style. Each group is separated into two subdivisions: dry and wet. Dry is pressed in a dehumidified area and wet is pressed in the presence of high humidity. Thus we have four different basic teas. Green takes a longer time to process than black style, longer to develop good flavor after fermentation. Dry takes longer to process than wet. Some manufacturers in Yunnan use a wet room to develop the tea. Wet may be processed that way, alone, for one year. This can result in a Puer with the musty taste of mildew. More careful processing of the wet tea, starting with wet and moving to dry over a one year period produces a more balanced flavor. However, the most appreciated, the most valued, is Puer that has been processed dry, alone, for at least three years. This is the best. Even longer is better. Aged Puer has become so popular that most Pu-erh now easily available is young. Fortunately, for Puer fans, the wet process produces a very drinkable black, young Puer tea. If the original Puer material is good enough, the tea is delicious. Puer processing causes magic to happen. Average tea becomes good, good tea becomes great! After 10 or 15 years, the result is indescribable. In Hong Kong and Taiwan, many people store Pu-erh to increase the flavor and the value. 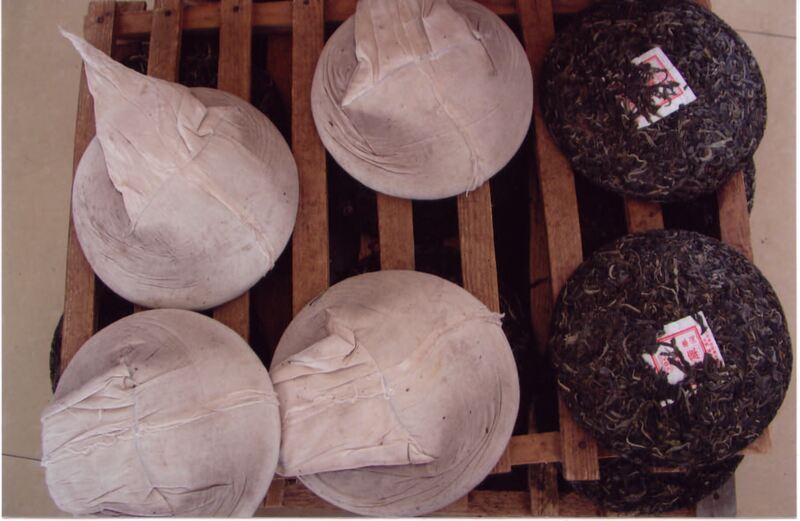 Some tea companies store Puer to ensure a high profit for the future. Puer is the only tea that becomes more valuable with age. Puer may be found in many different shapes. Loose tea, brick, mushroom shaped, round style cake, bamboo (filled with Puer). The best fresh leaf will usually go into loose and mushroom, second level will tend to be made into cake or into bamboo style. Although there are so many different shapes, after 10 or 20 years almost all of the tea becomes good. Like a student who studies for 10 or 20 years they become smarter. Pu-erh is very human-like, it becomes “smarter” with age. The eventual quality is still determined by the raw ingredients. What is good? What is not good? Just like other teas, the bud is best. One bud one leaf is the very best; two, three, or four leaves is second quality; no buds, only leaves is third quality; mostly stem and broken leaf fourth quality. If the Puer has whites buds and whole leaves then the quality is good. In a new Puer, the buds will appear more white An aged Puer has buds that are becoming a light brown. Orchid, Lily, Camphor Wood, and Palm. These descriptive words are meant to be evocative of the flavors so named. A highly prized and rare Orchid Puer will remind the drinker of the scent of a beautiful orchid. Each flavor is beloved by the Puer connoisseur. You may also judge a Puer by its color. If, after brewing, it is a beautiful gold or a dark red, you probably have a good Puer. However, if the color of your tea is black or muddy-black, you do not have a good Puer. Finally, and most important, you judge Puer by the taste. A good Puer tea is smooth on the palate. It will be sweet and it lovingly coats the tongue. The taste will be lingering and your mouth will be sad when it says goodbye. A good Puer may be brewed as many as seven times and still remain sweet, although the color will lighten with each steeping. A bad Puer, on the other hand will be overly astringent. It’s musty flavor will make your tongue uncomfortable and your mouth unhappy. It will kill your appetite. Puer is very good with meat. It is an effective digestive aid. Try Puer after a fine meal. This is a wonderful tea to serve at a barbecue. Puer also is a great addition to the fire when smoking meat or fish. For weight loss, Puer is always the first choice. Puer is good with cream and sugar and makes an excellent breakfast tea when served this way. It is also sometimes flavored with chrysanthemum flowers. When brewing Puer tea, you may use a Yixing clay pot which is good for holding the high temperature. Boiling water is very important. Aged Puer needs a high temperature to wake up the tea. Puer may also be brewed with a traditional Gaiwan, or any good tea pot. It is excellent when brewed in the Gongfu (Kungfu) style. For this method you must train with your local Tea Master. If no local Tea Master is available, or time is short, you may use the TeaMaster™ tea brewer which closely simulates the Gongfu method. In a regular tea pot, use one gram of Puer for every 30 cc’s of water (please use good water), and brew for 3-5 minutes. If the Puer is aged, brew a little longer, if it is young, be kind and brew a little bit shorter. If the Puer is the green style, brew this at 200oF. Brew black Puer at 210oF. If the Puer is aged, rinse with boiling water to just cover the leaves, then discard the water. Now proceed with your brewing. The true origins of tea are lost in the legends of time. One thousand years ago, the great sage Luyu described and codified the brewing of camellia sinensis. Over the ensuing millennium, tea styles such as green and black and oolong were perfected. When the Jurchen (Manchu) people established the Qing Dynasty and ruled from the Northern city of Beijing, tea was shipped long distances to satisfy the rulers. Thus, a new and mysterious tea style was born. Young tea was prized but aged tea became valued. In the cosmology of the once and forever that is China, the Middle Kingdom, Yin becomes Yang and Yang becomes Yin. Both old and new deserve respect. Today, when youth is most desired, try the old, try Puer, and balance will be achieved. The Qing (Ching) Dynasty, 1644-1911C.E.,was founded by the Jerchen people of Manchuria. It was the last feudal dynasty in Chinese history. During the Qing Dynasty, some of the highest highs, and lowest lows occurred in Imperial Chinese history. Along with the many health benefits derived from drinking any tea, Puer is also valued for lowering cholesterol and is popular in China as a weight-loss tea. In China black tea is usually referred to as Hong, red. This is either because of the lovely red edge that develops during processing or because of the beautiful red color of the beverage. 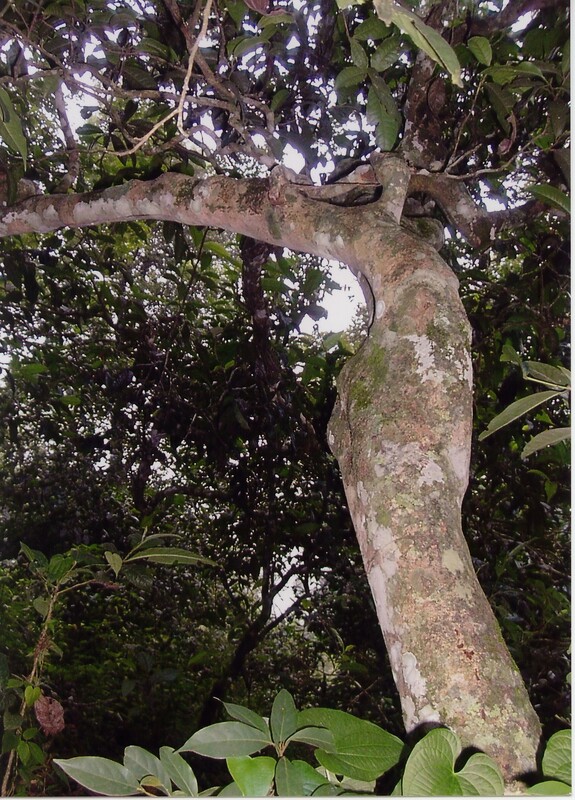 The oldest tea tree is believed to be 3,400 years old. All tea comes from the Camellia Sinensis plant. The large, tree-like plants are old and wild, while the new, domesticated plants have been bred to a smaller, more manageable size. Sometimes translated as Beautiful Clouds in the South. The characters for lake and heaven are different, but are pronounced the same. In olden times throughout China, tea was pressed into cakes, but this practice ended when it was found that loose leaf tea produced better flavor. Beijing was the capital city of China during the Qing Dynasty. Tea by any other name…a rant.